Enchanted handguns . . . sorcerous spaceships . . . clockwork golems . 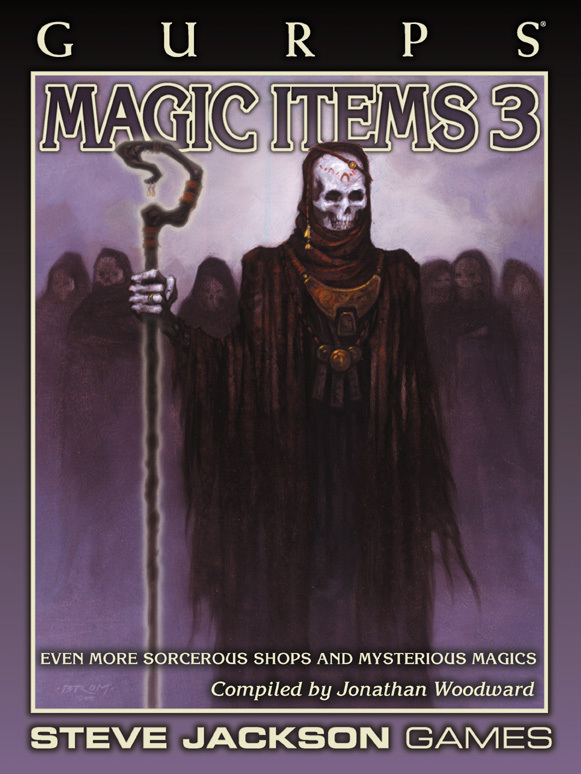 . . from the Ice Age to the distant future, GURPS Magic Items 3 is full of intriguing and exciting artifacts for magical adventures. There are "generic" items, suitable for a range of settings, as well as creations specifically for popular game settings like GURPS Technomancer, GURPS Steampunk, and GURPS Warehouse 23! Also included are several more weird and wonderful ways to create magic items; a dozen new guilds, organizations, and corporations involved in the magic item trade; and much more! GURPS Magic Items 1 – Here is a catalog of hundreds of original and imaginative enchanted items for use in any campaign, and the eldritch shops that sell these wonders. GURPS Magic Items 2 – New items for armor and protection, magical weaponry, mystical healing, necromantic magic, curses, tricks and traps, and more.